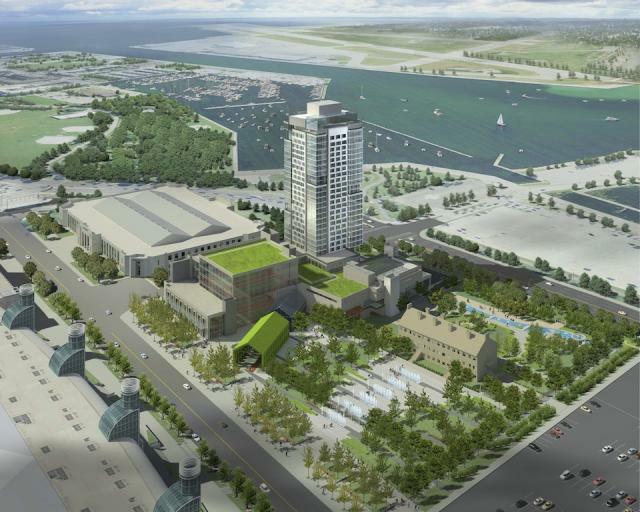 Hotel X is a 27-storey tower and podium complex currently under construction at Exhibition Place in Toronto. Originally dubbed Hotel in the Garden, the project was redesigned and renamed in 2012 after review by the City of Toronto's Design Review Panel, although the final design was not presented to the panel. The hotel is located at Newfoundland Rd and Lake Shore Blvd West, and was designed by NORR Architects and New York-based Stephen B Jacobs Group; the 409-suite hotel is being developed by The Library Hotel Collection and built by Brookfield Multiplex. In our last update in April we witnessed the topping off of the tower and the completion of the steel skeleton and roof of the adjacent sports facility. Seen in the photos taken this week is the tower almost completely sealed off; only 3 storeys of glass cladding remain to be installed. The construction of the 71,000 square foot sports facility has also progressed significantly since our last visit. The facility, which is a centrepiece of the development, will feature a 6,000 square foot weights/cardio/physical therapy centre, a 7,000 square foot yoga/dance/Pilates centre, 10 squash courts (including 2 American doubles courts), 4 indoor tennis courts, and a 9,100 square foot spa with terrace and private gym area for guests. The recent photos show lateral bracing installed and the precast wall panels and finishes being put up along the length of the building. The photo below is for our readers interested in the structural engineering principles behind construction projects. At the bottom of the frame is a perfect example of a reinforced concrete transfer beam, which is meant to take the forces from the columns above and transfer them into the columns that are offset underneath; this is typically done at the atrium level when the column spacing is increased to allow for larger clearances. UrbanToronto will continue documenting the construction progress of this project, so be sure to check our Forum thread and database file for further updates.